Ah, Tuscany -- how we love you. Home of all those wonderful Sangiovese grapes which get turned into Chianti and Vino Nobile di Montepulciano and rich goodies like Super Tuscan wines. The Super Tuscans, are not made according to the traditional standards of Tuscany. Instead, these wines generally have Sangiovese blended with other grape varietals like Cabernet Sauvignon or Merlot -- usually yielding wines that are bigger and richer than many of their Italian counterparts. So what happens when a winemaker in Montepulciano decides, "Oh, heck with it -- I've got all these high-quality Bordeaux-blend grapes...let's make a high-end wine from that juice and commit the heresy of including zero Sangiovese in the mix." The answer, or at least one of them, is the Avignonesi Desiderio Cortona DOC Merlot 2011. This Bordeaux blend of 85% Merlot and 15% Cabernet is a big, burly bottle of red, clocking in at 14.5% alcohol. It's aged for 18 months in barriques, which are the small barrels traditionally used to age Bordeaux. Thanks to Sean at Colangelo, I had the opportunity to try a sample of this high end (around $60) Italian red. Not a wine for the faint of heart -- this merlot is toothstainingly rich and thick. I'd say it's probably as big an "Old World" wine as I've come across any time recently. That said, the Desiderio starts with a nose that's surprisingly light. I caught the cherry notes that I usually find accompanying a Sangiovese-based wine, which is probably at least some function of the teroir. I also found some darker blackcurrant scents followed by a whiff of chocolate. Any illusions that the light nose might yield subtle flavors disappear quickly. On the palate. stuff gets going right away with the gobs of big, rich dark fruit that you'd expect in a merlot, but alongside a big blast of smoky tannin. The mouthfeel is big, tannic, and drying. The finish lingers long and dry, with plenty of plum and smoke. I found the Desiderio to be little rough around the edges, so you might want to consider laying it down for a bit. If you crack it now, decant it for a good long while, and serve it next to some hearty, preferably grilled, fare or big sauces to take the edge off. Many lamb preparations would be a good match here. Champagne. Sparkling wine. Spumante. Bubbly. It’s that time of year. Dom Perignon, the monk who popularized the concept of carbonated wine apocryphally stated, “Come quickly, I am drinking the stars!” upon opening a bottle in the wine caves of his monastery, and generations thereafter have shared that particular sensation, especially around this time of the year, when the loud pop of a cork accompanies celebrations large and small. “Champagne,” remember, is not a grape varietal or type of wine. It’s the region of Northern France where this style of wine originated, and where the most famous and most expensive versions of this sparkling wine -- like Veuve Cliquot, Moet & Chandon, and the aforementioned Dom Perignon -- are produced. If you go to the wine store and ask for “Champagne,” you might get steered over to this rack, where you’ll be staring at a bunch of French names and pricetags starting at forty or fifty bucks. Getting back to the French stuff, and getting down to brass tacks – in all honesty, Champagne can be a real ripoff. Yes, Champagne is wonderful. I’ve had the opportunity to try a few high-end champagnes, and they’re delightful. They’re flavorful and sensuous…and completely overpriced for my semi-educated palate. I say this since, if you’re reading this, I’m guessing you’re likely not going to be doing vertical tastings of high enders like Krug or Pol Roger anytime soon. Still, why are these wines so damned expensive? We pay a premium for these wines because of the name on the label – no different from buying clothes, cars, or headphones. In some cases, the quality of actual Champagnes might be slightly higher than other sparkling wines, but at 11:59 on December 31st, are you really thinking about doing a Parker-esque pull-apart of the various flavors? I thought not. If you’re opening vintage Champagne at midnight on New Year’s, you’re either showin’ off, or you’re at a ritzier party than I’m ever getting invited to. That said, there’s nothing quite like the ritual of cracking open a bottle of celebratory bubbly. Good news! Consumption of sparkling wine has increased sharply in the first half of this decade. (We must be in a collective mood to get down!) Because of this increased demand, there are many options to allow you to have a good experience while still maintaining a grip on your fiscal sanity. A couple of quick things to consider about buying sparkling wine. Unlike most reds and whites, many sparkling wines do not have vintage dates, as they’re often made from blends of wines from different years to produce a consistent product. Vintage wines often command higher prices, but that doesn’t necessarily mean that they’re better. Also, remember that the wine’s sweetness level is on the label. The traditional French nomenclature for sparkling wine is more or less the standard. The ones you’re likely to see are, from sweetest to driest: Doux (sweet) → Demi-Sec (semi-dry) → Sec (Dry) → Extra Dry → Brut. Yep. Brut is “drier than dry.” There are actually another two, even drier, levels -- Extra Brut and Brut Nature, but you’re unlikely to come across those. Crémant – We’ll start in France. Crémant (pronounced cray-mahn) has come to refer to French sparkling wine produced outside the Champagne region. Most Crémant is produced with the same methode Champenoise process that Champagne is, often with the same grapes. The big difference? These are more “everyday” French sparkling wines, and usually can be had for between ten and twenty bucks. The best known will be labeled Crémant d’Alsace, Crémant de Bourgogne, Crémant de Loire, and Crémant de Jura. All of these make excellent alternatives if you’re trying to look classy by putting a bottle of French sparkling wine on the table at your next party. Are they as high quality as high-end Champagne? No. Is that quality difference worth $50 or more? You be the judge. Cava – Over to Spain. Cava is my go-to inexpensive sparkling wine. This sparkler, produced in the area around Barcelona. The name “Cava” stems from the caves in which these wines were originally stored and aged. These wines are also produced in the same method as Champagne. I find most Cava to be crisper and somewhat more acidic than the creamy gentle bubbles in the French versions. The extra acidity, in my opinion, is what makes Cava perfect for tapas – allowing it to go alongside almost any kind of food. Cava is also quite inexpensive. For a typical bottle of Cava, if you’re spending more than $15, you’re overpaying. Prosecco & Moscato – The Italian sparkling entries. Prosecco is the more “traditional” version of sparkling wine – and you’ll typically find it nestled next to the Cava in your local wine store. I find it to be fruitier and slightly sweeter than other sparkling wines, which I think makes it a better option for an early evening palate cleanser or morning-after mimosas than for cracking at the end of the year, but your mileage may vary. Moscato, whose popularity boomed in the early 2000’s, is a sweet, peachy, low-alcohol sparkling wine that – as a wine-savvy friend once put it – “you could drink for breakfast.” Produced in both sparkling and still versions, Moscato is a favorite of brunch aficionados and high school shoplifters everywhere. United States Sparkling Wine – While some more expensive versions of “California Champagne” are decent (for instance, President Obama celebrated his inauguration with a special version of Korbel Natural), in general, they’re best used for christening boats or hosing down your friends after winning the sports contest of your choice. That said, there’s no shortage of high quality bubbly within our own borders. In my experience, the highest quality stuff comes from Northern California, and can be every bit as expensive as its French counterparts. However, there are many of these California products you’ll find in the $15-20 range that are very serviceable for any occasion. Oregon, Washington, and New Mexico are producing very good sparklers at bargain prices. Bottom line – unless you’re really wed to the idea of having “traditional” Champagne for whatever your occasion may be, you’ll have good luck finding alternatives that won’t break your bank. So snag some bottles and pop your corks. You deserve it. Just when I think I had this whole Italian wine naming convention down pat, I come to learn that those folks have gone and changed the rules on us. Actually, this happened a few years ago, but the newly named wines are finding their way to our shores now, so we might as well get ourselves good and caught up. So, what’s the story? · DOC – short for Denominazione di Origine Controllata, which means that the wine is made under a certain set of standards for a particular region, like Chianti. There is some flexibility for wine makers working under a “DOC” label. These are generally the standard wines from an area. · DOCG – short for Denominazione di Origine Controllata e Garantita. These wines are made under stricter rules than DOC wines. They are from particular vineyards, have strict aging standards, and tend to be the highest quality wines from a region, like a Chianti Classico. · VDT – short for Vino da Tavola, which translates as “table wine” and is…well…exactly that. Generally inexpensive wine made to be drunk young. · IGT – short for Indicazione Geografica Tipica. This designation, technically a subcategory of vino da tavola, was created for wines that don’t fall under the general classification system, but are considered of high quality. “Super Tuscan” wines fall into this category. · VDT – again, table wine, but the primary grape varietal must be listed on the label. · IGP – short for Indicazione Geografica Protetta, and is identical in standards to the old “IGT” designation. IGP is now a separate category from VDT. An IGP wine must pass certain standards for aging and quality -- which differentiate it from VDT. 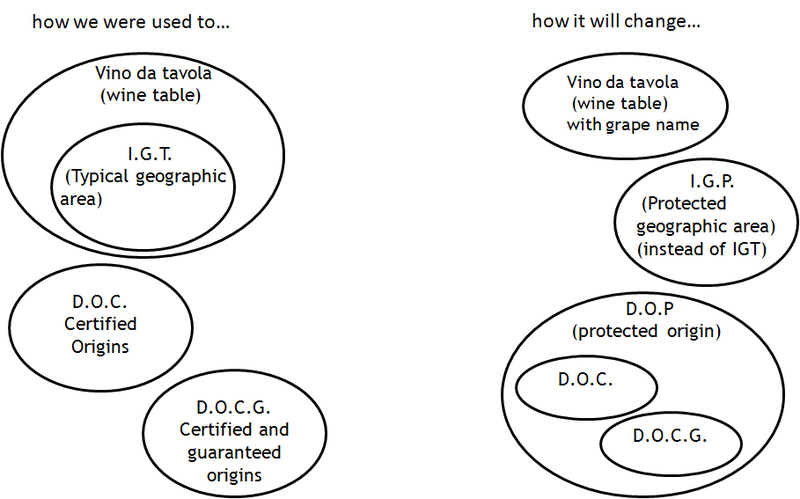 · DOC and DOCG wines are now both subcategories of DOP. DOP, or Denominazione d'Origine Protetta, is more often now applied to foodstuffs like tomatoes. DOP is basically a guarantee that, yes, an item is actually produced in a particular area of Italy. DOP and DOC are now used somewhat interchangeably, while DOCG is still the mark of highest quality. All DOP wines must now include a vintage, with the exception of sparkling wines. Many thanks to Italia Wijn! The DOP and IGP classifications are also used for other Italian foodstuffs like tomatoes, cheese, meats, etc. In those cases, the designation indicates that the items were actually produced in particular regions, using particular standards of quality. IGP is considered less stringent than DOP. Look at a can of real Italian tomatoes next time you’re at the grocery store and you can see what I mean. The aforementioned samples,from Maggie at Colangelo, are from Acinum wines – a new producer from the Veneto region. “Acinum” is Latin for “Grape,” and these wines are intended to provide relatively low-cost, high quality Italian juice. Acinum (NV) Prosecco Extra Dry DOP – Quite a nice Prosecco. Very pleasant flavors. Straightforwardly crisp flavor of lemon at first sip, with a lively carbonation. The flavors settle into a lemon crème and pear palate which smooths nicely into little acidic tingles at the back end. Just a very pleasant sparkler. My sister was visiting the Sweet Partner in Crime and I when we opened this over brunch. We had it with an arugula salad with roasted butternut squash & white sweet potatoes, toasted walnuts, and pomegranate seeds in a citrus and sesame oil dressing. Made easy what would have been a somewhat difficult pairing. Also makes great mimosas! $11. Acinum 2014 Soave Classico DOP –The Acinum Soave isn’t the lean, acid-driven sipper that many of its Italian compatriots are. A much fuller-bodied white than your Pinot Grigio or Vernacchia, the Soave is a richer, creamier experience. The nose is quite floral, a bit of a “Viognier-lite” in character. The first tastes are quite fruity, but the body is quite silky and elegant, full of honey and pears. The finish does turn slightly acidic, but in a very pleasant manner that makes it quite food friendly. While suggested as an aperitif or with fish, we had this with a braised chicken with fennel and white sweet potatoes (can you guess what we got in the farmshare this week?) and it more than held its own. $11. Acinum 2012 Amarone della Valpolicella DOCG – Amarone is one of the biggest, most expensive Italian wines. Made from raisinated grapes, these wines generally pack quite a punch. This one is dense and full without being heavy. I got leather, plum, and a little raisin on the fragrant nose. Big concentrated dark fruit flavors were followed by a shot of smoke on the palate. Lots of structure with a great balance between fruit and tannin. Certainly a muscular wine, but no one flavor takes over too much. The finish goes on and on with blackberry and smoky tannin. I could easily get remnants of flavor after well over a minute. Strong and elegant. Well done. The pricetag on this one stunned me. Retail on this one is $55, which seems high – but many Amarone will run you that for a half-bottle. Snag for a special occasion. If you’re a little confused by the shifts in designations, don’t worry. A little extra research turned up the fact that while winemakers must register with the government under the new naming conventions, their labeling can remain basically the same. So, for the most part, don’t worry about IGT/DOC/DOCG going away or referring to new things anytime soon. Keep calm and drink on.